Explore over 100 miles of the John Muir-Pacific Crest Trail through wildflower-blanketed valleys, alpine lakes and forested campsites. Opportunity for Golden, Rainbow and Brook trout fishing. The wildlife, glaciers and majestic peaks over 13,000 feet made this John Muir’s favorite backcountry – his “range of light”. We will ride over Mono Pass and join the John Muir Trail before crossing Silver Pass. Continuing on past countless lakes, we skirt the mammoth Divide, permitting stirring views of Cascade Valley and Fish Creek, to descend to the base of the Minarets. Journey past Mt. Ritter and Mt. Banner before climbing to Donohue Pass, the entrance to Yosemite National Park. Our last camp is in the Lyell Canyon. 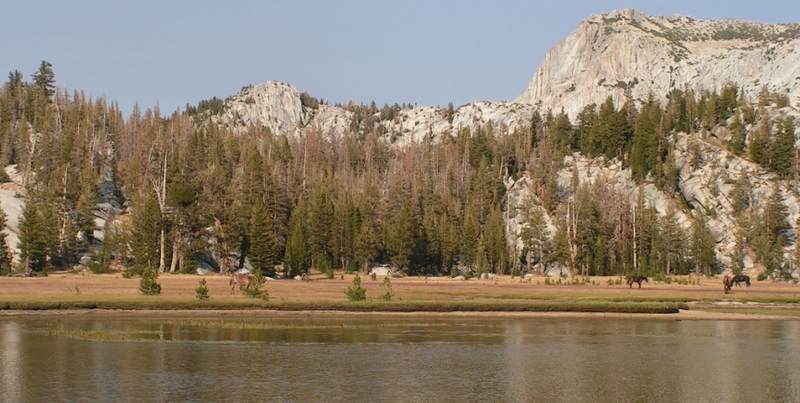 We explore what some call the most majestic meadows in the Sierra in our last day’s ride. Leaving Rock Creek Pack Station (10,000ft. ), the route follows the Mono Pass Trail, which ascends Mt. Starr to Mono Pass (12,000ft). Enjoy the views of Little Lakes Valley framed by Mt. Morgan (13,748), Bear Creek Spire (13,601), Mt. Dade (13,601), Mt. Mills (13,468) and Mt. Abbott (13,715). After crossing the pass, enjoy unrestricted views of Pioneer and Hopkins Basins. Riders descend past Trail Lake before coming to Gold Creek. Riders ride alongside of Gold Creek and Mono Creek to reach camp down canyon near the confluence of Third Recess and Mono Creek. Estimated riding time: 5 hours. Continue north on the Muir Trail past Silver Pass Lake to reach Silver Pass. (10,900). To the south, view Seven Gables Mt. (13,075) – a grand peak overlooking Bear Creek. To the northwest, see Mt. Ritter and Banner Peak and the edge of Yosemite. Descend to the head of Cascade Valley after passing the five lakes in the basin of the Lone Indian. Riders cross the Fish Creek Bridge before following the Muir Trail a short ways to Tully Hole and Horse Heaven. Estimated riding time: 4 ½ hours. Riders make good time descending into Red’s Meadow (7,500). Ride through Devil’s Postpile National Monument. These cliffs of crystallized columns of basalt are right next to the middle fork of the San Joaquin River. After crossing the river, the trail ascends alongside Minaret Creek to Johnston Lake (8,150). We ride another hour and a half through forests, ponds and meadowy country to Gladys lake (9,600) Estimated riding time: 5 hours. Day 10: Lyell Fork Canyon to Tuolomne Meadows.